Beyond the Medina and fishing port, past the make shift football pitches on the town beach where players berate their teams for poor play before burying their heads in despairing hands, lies a further stretch of beach. We walked for about 30 minutes along the promenade and promenade to be built eventually arriving at a kit surfing school, a cheap but good restaurant, a place that caters for sun worshippers (has an enclosed area of sunbeds – bikinis allowed) and a beach covered in dung. 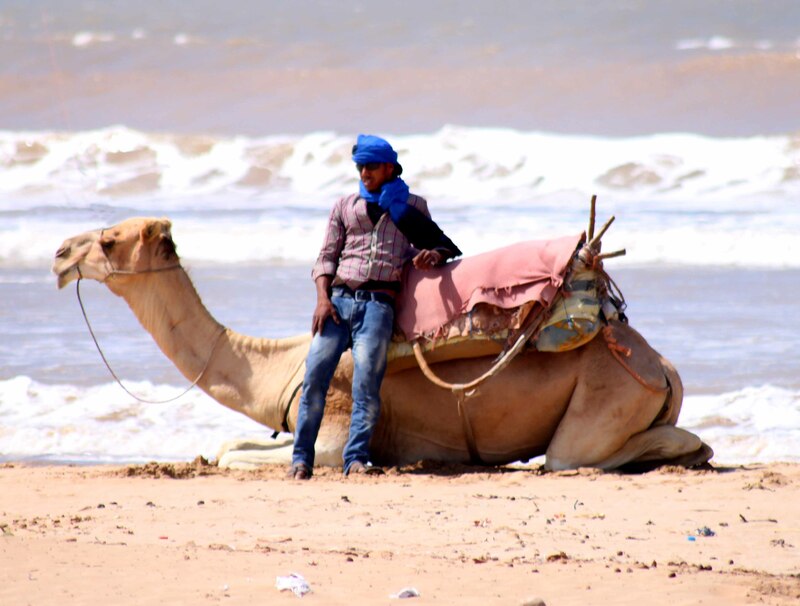 Here, the locals offer camel and horse rides. A return trip on a bottom swaying, tooth grinding , ship of the desert takes one down the beach a further mile or so past the 2 abandoned islands complete with ghost town and medina. We passed deciding to sit on the dunes for a while to soak up the atmosphere and take some photographs. Here is a tip, never point a camera in the direction of a camel whilst there is an owner riding, leading or lounging against the animal. They will spot you and come over to demand money. Some even deliberately walk into the background whilst you are taking a photo of the scenery and ask for recompense. Beware of camels left on their own who bat their eye lashes at you – their riders will be hiding somewhere close ready to spring out as soon as the camera clicks. Luckily I observed these scams and learned to be discreet. As we were soaking up the rays a camel and its owner headed towards us. Pleasantries were exchanged, information swapped and Ali sat in front of us. His camel folded down behind him and proceeded to gaze at me with huge smoldering brown eyes – and yes he actually batted his eyelashes. If ever there was a cute camel this is the one i thought. Ali took the ‘lets all be friends tack’ and after telling us about where he lived and that he by coincidence had a brother in Melbourne, proceeded to question us about our holiday, then gave us a lowdown on Hendrix and Dylon’s stays. Amiable relationships established he started in on the hard sell. “No thanks” I replied “ we have thousands of them in Australia and I don’t like them much. James continued with the seduction routine managing to look adorable and innocent at the same time. “He won’t hurt you” Ali said and went to demonstrate how easy it was to get in the saddle. As he passed by the camel’s head, James’s tried to take a chunk out of him. We all found it funny and Ali realising he had lost the sale sat back down just to talk. “James, you are awesome” I said laughing.